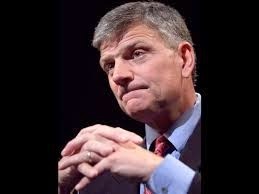 Franklin Graham is in the newspapers this morning, giving an interview in which he said that he's just been mouthing his father's opinions on gays and Vladimir Putin and that he's merely trying to help people get to heaven, that's all. I knew preachermen like Franklin Graham all my life growing up in West Texas, slick hucksters who sold repentance while wearing tailored suits and driving great big new cars. None of them that I remember also had multiple private jets at their disposal, so Franklin Graham has shown 'em all up. What a role model! I also knew pharisees, men who liked to stand in the center of church and proclaim their own knowledge of God's will. They wafted their own righteousness among the pews like over-cologned car salesmen. They pointed their fingers at sinners in their midst and always said they weren't criticizing, just trying to insure that those sinners made it to heaven (along with them, naturally!). Franklin Graham is such a one. That he would now lay his hateful utterances at the feet of his dying father is not only cowardly. It's also reminiscent of the religious leaders that Jesus preached against: "Woe unto you, scribes and Pharisees, hypocrites! for ye are like unto whited sepulchres, which indeed appear beautiful outward, but are within full of dead men's bones, and of all uncleanness." If Franklin Graham was not directly responsible for the recent uproar over banning books at Watauga High School, he certainly was standing by holding the coats for those who were fanning those flames. Rather than the Gospel, he preaches division. Rather than love, he inspires resentment and back-biting. He seems far more interested in building a center of power for himself in Republican circles than in advancing the Kingdom of Heaven. Franklin Graham has a form of godliness all too popular these days, from Pakistan to Deer Valley. St. Paul advised, "From such, turn away." This man is one scary dude. Disgraceful. So sad to see an honorable man used in this fashion! I could not agree with you more!!!! I wounder if the poster of this article, or those commenting to this blog, have ever attended a service where Rev. Graham's spoke??? From the content of both the published article and the comments, one is led to believe this group regularly attends Graham's revivals, but I doubt this is the case. How can you know a man's behavior/character if you've only seen him interviewed on TV answering questions posed to him? Maybe you just disagree with Graham's politics - maybe politics and religion shouldn't be mixed in your minds? That is a fair opinion, but where then is your criticism of Rev. Barber and Al Sharpton for using their roles as spiritual leaders to influence policy issues? Graham discribed as "a scary dude"? How and why? He runs one of the most effective and efficient disaster relief organizations in the world. Whenever there is a disaster, Graham's organization is there, helping those in need. (I'll not even mention the humanitarian efforts his organization spearheads each and every day.) What is "scary" about that??? If you don't like his politics - fine. But don't blanket you hate for conservatism in attacks on a man who does a tremendous amount of good. Just say, "we don't like conservatives like Graham," no need to lie. If you don't like Christianity - fine. But don't mask your disdain for a particular faith by attacking a religious leader you know very little about. I doubt you'll see this comment published, my thoughts never make it past the editor's cutting room floor - see A Watauga Conservative - it's a place where actual discussion and debate take place. The 2nd year of the Shoe Box ministry I delivered boxes to Wingate U to the collection truck at the Jesse Helms Center and stayed to hear Graham speak. I admired what he was doing and got my church involved. It was a great speech until he played to his majority right wing audience by making jokes about visiting the White House and the little mountain lady with him addressing Hillary Clinton as Ms. President. He got a lot of laughs making fun of such a thing, although I felt like booing him; I decided against it. It was insulting to Democrats in the audience who were there to support his mission and I didn't leave with the same high opinion of Graham as I had arrived with. Looks like his worst nightmare will come true in 2016. Jesus himself was quite political, and that's what got him killed. But Jesus's politics were on the side of the poor and downtrodden while Franklin's politics always favor the rich and powerful. Franklin leaves his luxurious mansion and works at his high tech ultra-modern office, before flying in his private jets to distribute flashlights and toys donated by his faithful (credulous)followers. How does Franklin support his luxurious lifestyle? “As president of the Billy Graham Evangelistic Association and Samaritan’s Purse, he receives two full-time salaries and two retirement packages. Last year, his total compensation from the two ministries was $1.2 million." And unlike most working people in this area, I expect he's had a few raises in the intervening 5 years. "I doubt you'll see this comment published, my thoughts never make it past the editor's cutting room floor"
Oops....another post about JW's editing skills. How many times does it have to be repeated? This is JW's blog - he can do anything he wants with it! If you want to post your opinion and you think JW is stifling you, then create your own blog and post all night long! There are plenty of free sites out there! Besides, you were just proven wrong, anyway. Does Buncombe Have More Drama Than Watauga? Kevin Siers, Charlotte Observer, 12 March 2014.